Double Eagle, New Birdshead and some Old Armoury Original are some of the new models from US Firearms including the gym kit and the adjustable weight dumbbells kit. Double Eagle and New Birdshead both come with hard rubber birdshead grips. The main difference is that the Double Eagle model has an ejector, a large loop trigger and other options for barrel lengths and calibers. The barrel length options for the The New Birdshead are 2″, 3″ or 4″. It has a blackpowder frame (angled screw through front of frame to secure cylinder base-pin) while the Double has a frame with the spring loaded cross pin screw. As of now, the New Birdshead will be available in .45 Colt only. Other models are in the pipeline for 2010 as well. The Sparrowhawk is an eight shot, 7 1/2″ barreled revolver in .327 Federal with an adjustable rear sight, large loop trigger guard and removable firing pin for easy cleaning. 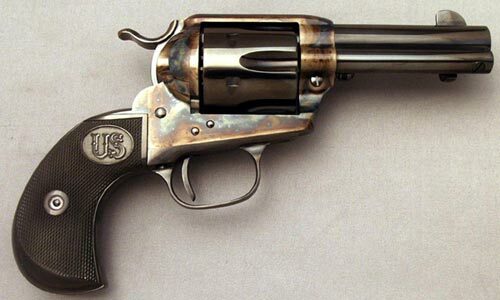 It is a scaled down version of the large single action revolver. Another version of this model is the Shooting Master in .357 Magnum. The Old Colt Single Action reproduced by USFA is now available in what they call a true 1st Gen. small frame window and true scale cylinder. The model is called Old Armory Original The front sight blade on this model is the smaller more shapely tapered blade we see on perfect 19th century originals. Other options in this model are the .455 Eley and ejectorless versions.